Our senior program provides a wide range of social activities including group lunches, free health seminars and special discounts. 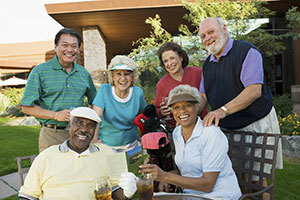 We are committed to providing beneficial resources to men and women 55 years and older. Join now and enjoy the benefits that come with age! Free copy of Source magazine, which includes a special section dedicated to our members and features special events, monthly activities, health seminars and travel opportunities. Discounts on monthly membership fees at our Wellness Centers, the region’s premier health and wellness program. Call (256) 265-9355 for rates. Discounts on a variety of healthy food choices at our Main cafeteria. The cafeteria serves breakfast, lunch and dinner seven days a week. Long-distance tours hosted by professional tour agencies. Travel destinations are listed in Source and full itineraries are available in the Senior Horizons office. Tasty Tuesday – Sometimes catered, sometimes potluck-style and always on Tuesday. Lunch Bunch – The second Tuesday of each month, members have the opportunity to try out area restaurants while enjoying the company of friends. Free photocopying and notary service at the Senior Horizons office during office hours. Free valet parking at Huntsville Hospital Main for members 65 years and older (Monday through Friday, 5 a.m. to 6 p.m.). Please contact our office for information on parking rules and regulations. Senior Horizons volunteers support hospital staff by assisting with clerical projects and special events. Our Sew Healing volunteers meet every Monday morning to make therapeutic pillows for cardiac patients, palliative care patients, pediatric patients, patients recovering from abdominal surgeries, orthopedic injuries, mastectomies and oncology patients. More than 100,000 pillows have been given to patients since the program’s inception in 2001. Click to view upcoming events from Source magazine. Mon. - Wed.: 8:30 a.m. - 2:30 p.m. If you would like to renew your membership on a day the office isn't open, you can still do so at the Huntsville Hospital Cashiers Office (located to the left of the C-elevators on the 1st floor).